For everyone who thinks they know everything about "How I Met Your Mother," prepare to be lawyered. 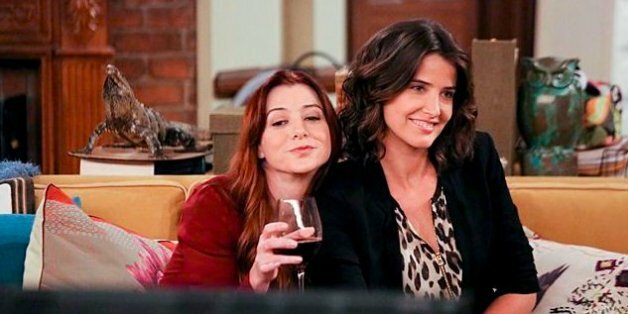 Alyson Hannigan, otherwise known as Lily Aldrin, has been busy since the show ended a little more than a year ago. She's had her hands full with being a mom, has a role in a new film called "Modern Love" and she's even working with Ball Park Park's Finest hot dogs, which she did admit, though she "usually" doesn't try to brag, looked so good after she cooked them over a campfire that they wouldn't even need a filter on Instagram. During a short reprieve from her busy schedule, Hannigan took some time to chat with The Huffington Post about some behind-the-scenes stories from "HIMYM." Prepare yourself: they might change the whole way you look at the show. When asked if the cast had any interventions that didn't make the show, Hannigan said, "We talked about needing an intervention for ourselves to stop making so many puns. We would just pun for hours and hours and hours. It was great, but we were like, 'We might have a problem,' but we enjoyed it." The puns all started when a guest star mentioned the magazine Cat Fancy, Hannigan added: "We started having cat puns, and we had an afternoon of punning anything about cats. Fancy that!" 2. Alyson Hannigan's real kid was fired from the show. One of Hannigan's kids was slated to play Lily and Marshall's second child, but then she got some disappointing news. "They fired my kid from that role. She was gonna be the baby, but [producer] Carter Bays was like, 'Nope. She’s too old,' and she got replaced," Hannigan said. "I was like, 'You fired my child. First of all that’s ageism. I don’t think you’re allowed to fire her because she’s too old,'" she joked. The Cockamouse was the mysterious hybrid creature that Marshall and Lily found in their apartment, and though it seems like something someone made up, like the "South Park" monster ManBearPig, it turns out this was based on a real story. "Yes, that is based on a story that happened to [producer] Kourtney Kang in New York in an apartment she lived in," says Hannigan. She continued, "They were not sure if it was a cockroach or a mouse. And they’re pretty convinced it must’ve been both and it did fly away." To that, HuffPost responded, "Are you freaking kidding me?" Hannigan said, "I don’t think it flew out of the window, but it flew." "Early on, I wanted Victoria to be the mom," Hannigan said. "I guess Carter later said had we got canceled she would’ve been the mom. But, you know, somebody great would come on [the show] and we would be like, 'Yeah, we want her to be the mom,' so it was sort of just like whoever was on for a long period of time. We’re like, 'Let her be the mom. Let her.' We just loved everybody." Actor Josh Radnor was told about the major "HIMYM" finale twist during Season 1 of the show and Hannigan actually found out early as well. They had to film a lot of reactions for Ted Mosby's kids early in the series that would then air in later seasons, the actress said, and after that some "whisperings" started getting out that the series would end with the mom's death. "I knew that was the case," said Hannigan. "I didn’t know who the mom was going to be, but I did know that the reason he was telling all these stories is because she passed away, which was very sweet." Hannigan says the whole process of finding the right actress to play the mom was "very secretive" and caused some suspicion around set when trailers that would "never be locked" suddenly were. Hannigan says she first met the mother, Cristin Milioti, in a makeup trailer because producers wanted to see how the pair looked side by side. "They wanted to look at us next to each other to see if they were going change her hair or something because they were a little worried that we looked similar, so I had to go stand next to her and we had some people look at us together," she said. Each of the main cast members on "HIMYM" had a musical number except for Lily -- and it turns out there was a good reason for that. "I begged them not to make me," said Hannigan. "Yeah, singing has never been something that I wanted to do publicly. It’s actually like a phobia. I know it sounds weird, but it has always been that way. And then I find myself in these shows that want to do musicals, and I'm like, 'Noooooo!'" Hannigan says she has gotten better when it comes to singing, but she's "not gonna be dropping an album anytime soon." 8. If it was up to Jason Segel, "HIMYM" would have a Hanukkah reunion show. The actress told HuffPost she'd definitely be into a "HIMYM" reunion and that Jason Segel was actually coming up with some ideas during the finale. "Jason was pitching some really funny specials, like a Hanukkah special and all these things with Carter. It was quite funny... Carter said we could do eight Hanukkah specials. One for each night. I'd be up for it," she said.